NEWBURYPORT — When Mitch Cohen was in the throes of addiction two years ago, he did all the heavy lifting to get himself sober, but the Pelican Intervention Fund lent a helping hand. 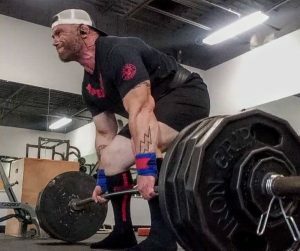 Cohen will put his physical strength to the test Sunday at the RPS Powerlifting Championships in Lebanon, New Hampshire, while raising money for the Pelican Intervention Fund as part of his Pounds for Pelican fundraiser. The Pelican Intervention Fund is a Newburyport-based nonprofit that pays for residential 12-step recovery programs for low-income adults struggling with alcohol or drug addiction on the North Shore. It was founded in 2015 by Kim Keene, Steven Keene and Elizabeth McCarthy. Cohen, a 40-year-old Newburyport resident, is a competitive powerlifter and record holder in Men’s Revolution Powerlifting Syndicate’s 242-pound Amateur Division. He said he has come a long way since he was approached by McCarthy in August 2016, a time when his “life was in the gutter” because of alcoholism. Cohen’s problem drinking began in high school, and by his mid-20s, it started affecting his relationships and alienated him from his family. He tried Alcoholics Anonymous and other detox programs, but said he never managed to stay sober longer than a few months because he couldn’t tackle the core issues behind his addiction. That all changed after Cohen applied to the Pelican Intervention Fund, which paid thousands of dollars for his three-month stay at the Brook Retreat in Plympton. He has been sober since Aug. 2, 2016. Now engaged to be married and working in construction, Cohen said he wanted to thank the Pelican Intervention Fund for everything it did for him and decided to do so through powerlifting, a hobby he took up in 2013 with friends at Link House to help deal with the stresses of getting sober. After starting the Pounds for Pelican fundraiser, Cohen began collecting donations from local construction firms and other businesses, as well as from his friends and followers online. Soon enough, he found that the community’s generosity exceeded his expectations. By the beginning of this week, Cohen said he raised just short of $12,000 for the Pelican Intervention Fund. “I was shocked, I was hoping for maybe two grand,” Cohen said. McCarthy said she and her fellow co-founders are grateful for Cohen’s help and that he is a symbol of what people can accomplish with the organization’s help. Cohen is now only days away from the competition and hopes to squat 525 pounds, bench press 375 pounds and deadlift 565 pounds. It’s a lot of weight, but it’s nothing compared to recovering from alcohol addiction, or even going around asking business owners for donations, he said. Donations for the Pounds to Pelican fundraiser can be made through Saturday night.